Gauging the performance of your investments is an important part of the investment process. But knowing an investment’s gain or loss is only part of the picture. Comparing that gain or loss to what’s happening in the broader market, gives you another important perspective and another data point in your decision making process. For example, an investment that has improved 10% over the last 6-months sounds good. However, if the broader market, as defined by an index or an ETF that mirrors the index, has improved by 15%, your investment’s 10% improvement may not be as good as you think. To help give you this important perspective on your investments, StockMarketEye provides “Benchmark” columns to help compare your investment’s performance with the broader market. You can use any ticker symbol as your comparison benchmark and you can use a different benchmark for each portfolio. By default, the benchmark columns will use the S&P 500 index, ^GSPC, as the comparison benchmark. You can change this symbol in the Portfolio’s Settings window, in the “Portfolio” tab as seen in the image below. A number of world indexes have been included in the list, but you can also enter your own symbol. For example, you may wish to use the SPY, an ETF that corresponds to the price and yield performance of the S&P 500 and pays dividends (which a pure index symbol, such as ^GSPC, does not). Indexes do not pay dividends themselves because they are not tradable securities. ETFs or mutual funds that mirror indexes however can (and often do) pay dividends. You may want to use one of these ETFs or mutual funds as your benchmark symbol, rather than the index itself as the ETF represents something you can actually invest in and receive dividend payments from, making the comparison more realistic. For example: DIA is an ETF that mirrors the Dow Jones Industrial Average; SPY is an ETF that mirrors the S&P 500 Index; and QQQ is an ETF that mirrors the NASDAQ-100. StockMarketEye provides the following columns that can be added to your portfolios, allowing you to compare your investment’s performance vs the chosen benchmark. See the section, Configuring Columns, for how you can add these columns to your portfolio. Benchmark Symbol - The currently configured benchmark comparison symbol. In a Portfolio, this symbol will also be shown in the column header of each benchmark column. 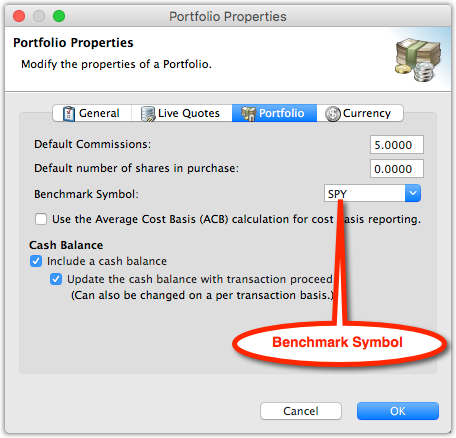 You can specify the ticker symbol to use as the benchmark comparison symbol in the Portfolio’s Settings window, in the “Portfolio” tab. You can use any ticker symbol you like as well as having a different symbol for each portfolio. Benchmark Shares - The number of shares in the benchmark that would be owned if this item’s initial investment amount was used to purchase the benchmark symbol and all dividends paid by the benchmark since the purchase date were re-invested. Benchmark TR (aka. Total Return) - The total return, including transaction costs and dividends, that this item’s initial investment amount would have returned if it was invested in the benchmark and all dividends paid by the benchmark since the purchase date were re-invested. Benchmark TR % (aka. Total Return Percentage) - The total return percentage, including transaction costs and dividends, that this item’s initial investment amount would have returned if it was invested in the benchmark and all dividends paid by the benchmark since the purchase date were re-invested. Benchmark CAGR - The Compounded Annual Growth Rate (CAGR) that this item’s initial investment amount would have returned since purchase if it was invested in the benchmark. Includes transaction costs and re-invested dividends. Benchmark TWRR - The compounded annual Time Weighted Rate of Return (TWRR) that this item’s initial investment amount would have returned since purchase, if it was invested in the benchmark. Includes transaction costs and re-invested dividends. The calculation is performed using only the currently held, non-re-investment lots as cash flows. Benchmark IRR - The Internal Rate of Return (IRR) (also known as the Dollar/Money-Weighted Return) that this item’s initial investment amount would have returned since purchase, if it was invested in the benchmark. Includes transaction costs and re-invested dividends. The calculation is performed using only the currently held, non-re-investment lots as cash flows. We suggest using a benchmark symbol that you can actually invest in, rather than a pure index symbol. Symbols you can actually invest in provide a more “real-life” benchmark, including paying dividends, which a pure index symbol will not. For example, use SPY rather than ^GSPC; or QQQ rather than ^IXIC. The benchmark symbol’s dividends paid since the item’s purchase date are re-invested. All benchmark column values are computed with those re-invested dividends taken into account. 2 investments purchased on exactly the same day may have slightly differing benchmark (TR%, CAGR, etc) values. This is because transaction costs are included in the benchmark value calculations. As the transaction costs are usually slightly different percentages of the initial purchase amount, that difference is also reflected in the benchmark column values.